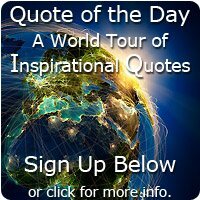 A Top 10 list of Franklin Roosevelt quotes and background information. Profile: Franklin D. Roosevelt was born on 30th Jan, 1882, into a wealthy family of Dutch descent. He was a decent student at Harvard University but mostly failed in his athletic pursuits. Roosevelt married at 23 to Eleanor, a distant cousin. He was also a distant cousin to Theodore Roosevelt. Franklin became a lawyer 1907, then in 1910 his chance came to enter politics and he was elected to the New York senate. In 1912 his hard work in helping get Woodrow Wilson elected president won him the position of assistant secretaryship to the Navy. In 1921 Franklin D. Roosevelt became seriously ill with Polio. He was paralysed and had to learn how to walk again. This only served to mould his character more, and he showed great perseverance to overcome his disability. He went on to become the 32nd president in 1932 during the worst depression of America's history. Roosevelt made sweeping changes and was so popular that he won a second term with a landslide victory. In 1940 with war on the horizon he ran again, securing only a narrow victory. America was forced to enter the war when Japan attacked Pearl Harbor in 1941. Roosevelt was still president in his 4th term with the war virtually won, when he died in April 1945. Franklin D. Roosevelt, from a wheelchair, lifted a nation with his optimism and determination and helped to secure victory in World War Two and peace thereafter by pushing for a 'United Nations'. to live together, in the same world at peace." "It is common sense to take a method and try it. what you are going to do to get the things you want." 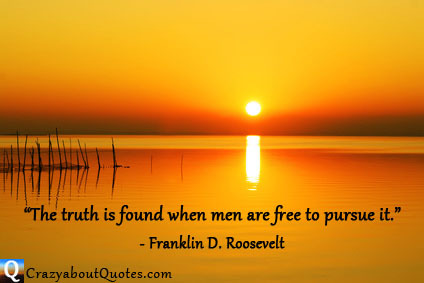 "The truth is found when men are free to pursue it." "To reach a port, we must sail - not tie at anchor - sail, not drift." the impact of spiritual force." knowing him was like drinking it."